NEW YORK/LONDON (Reuters) - JCDecaux SA (JCDX.PA), the world's biggest outdoor advertising group, is exploring a bid for the European advertising assets of U.S. rival Clear Channel Outdoor Holdings Inc (CCO.N), according to people familiar with the matter. The deal would combine the European assets of the two largest outdoor advertising agencies, helping JCDecaux weather an economic downturn on the continent. It could also attract scrutiny from regulators over antitrust concerns. JCDecaux met with investment banks in recent weeks to appoint a financial advisor that will help put together an offer for Clear Channel Outdoor's European assets, which could be valued at more than $2.5 billion, the people said on Monday. To address potential antitrust issues, JCDecaux is considering teaming up with a private equity firm in its bid and then split the assets, two of the people said. However, JCDecaux might bid on its own, the people added. Clear Channel Outdoor shares jumped as much 6 percent on the news on Monday and closed up 1.7 percent at $8.26 on the New York Stock Exchange. Reuters reported last month that the debt-laden parent of Clear Channel Outdoor was exploring options for its European outdoor advertising business after receiving offers from private equity firms. Moelis & Co (MC.N) and Citigroup Inc (C.N) are advising Clear Channel Outdoor on the potential sale of the European assets, the people said. The sources asked not to be identified because the deliberations are private. JCDecaux, Clear Channel Outdoor and Citigroup declined to comment, while a Moelis spokeswoman did not respond to a request for comment. Clear Channel, which generates revenue from brands that rent out space on its signs, has its biggest European markets in France and Britain. The company also has billboards in Italy, Sweden, Turkey, Poland and the Baltic regions, according to its website. Its assets include signage in shopping malls, buses and in airports such as London's Heathrow. Clear Channel's parent company has been struggling to trim $20.5 billion of debt. It unloaded assets such as a 50 percent stake in Australia Radio Network, which it sold earlier this year to APN News and Media Ltd (APN.AX). Clear Channel Outdoor's President and Chief Financial Officer Richard Bressler said during an Oct. 28 conference call that Western Europe was a big driver of sales for the company this year. Paris-based JCDecaux, which has a market value of 6.1 billion euros ($7.5 billion), earns about two-thirds of its revenues in Europe and the rest in faster-growing markets such as North America, China and Latin America. Speaking at an investor conference in Barcelona last month, JCDecaux co-chief executive Jean-Francois Decaux said scale offered advantages in the outdoor advertising business. "The competition authorities (in Europe) are more relaxed about consolidation in our industry than ten years ago," he said. 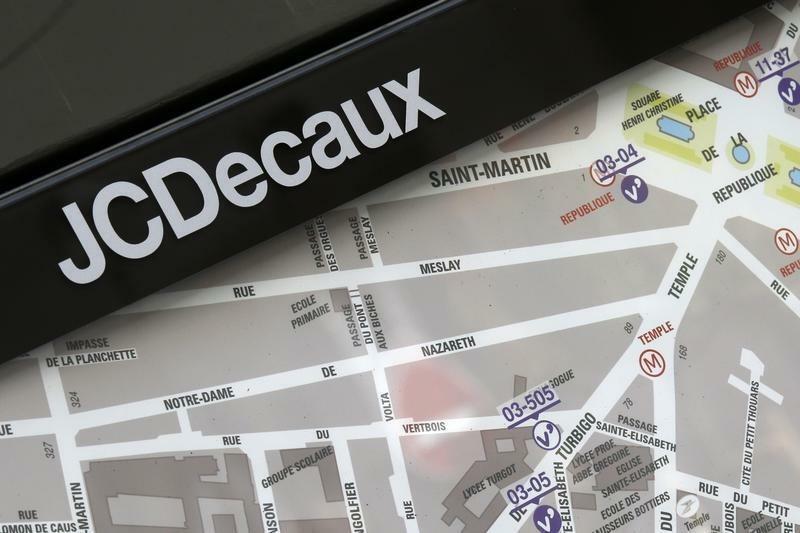 The Decaux family owns 72 percent of the eponymous company. About 88 percent of Clear Channel Outdoor is owned by iHeartMedia, which was taken private in 2008 by buyout firms Bain Capital LLC and Thomas H. Lee Partners for $19 billion. The outdoor advertising market has undergone consolidation over the past year. In July, CBS Outdoor Americas, which has now been rebranded as Outfront Media, acquired smaller peer Van Wagner for $690 million. CBS sold its international outdoor business to private equity firm Platinum Equity LLC last year.